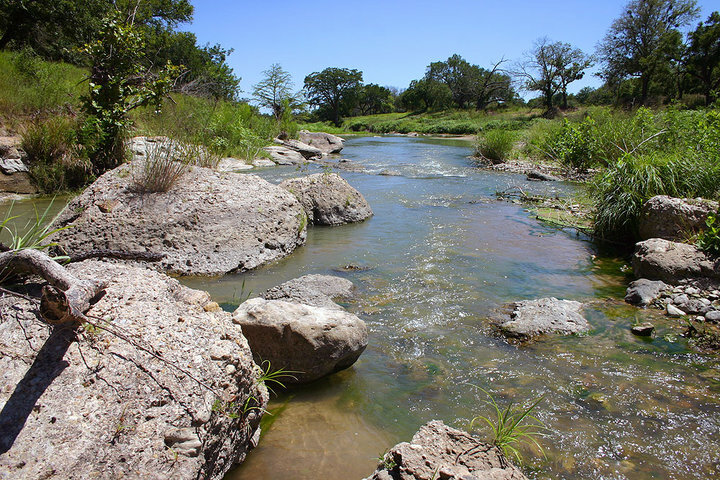 In 1949 my Aunt Cot bought 45 acres out of a 110-acre tract on the Scenic Loop Road north of San Antonio. Charlotte and I decided to purchase the other 65 acres. I went to the Catholic Life Insurance Union and got a loan of $10,000 to buy it. I paid $194.00 per acre for the place. The rest of the family said we had lost our minds, buying it and paying so much, but we were happy with it. It was beautiful land. A friend of mine who had ranched many years bought a little set of cattle for us to put out there. I think it was twelve cows and a bull. Well, he delivered them one Saturday morning early, and he must have bought them somewhere near Laredo. I don’t think they had seen a human in years, if ever. When he opened the back gate of that trailer, those cows came out of there like a bunch of kangaroos, jumping and kicking, and running in every different direction. I later learned that when you bought some cattle that were used to being together, even if you moved them many miles away, when you unloaded them they would all stick together. They would all go together all the way around the perimeter fence checking it for a place to get out. The only water I had was from my well that had an old water-cooled pump jack on it that pumped the water into a big rubber tank. The pump jack was what they called a “One Lunger” and you had a flywheel you had to spin to get it started. That flywheel was hard to spin and it took everything I had to crank it. Sometimes I would have to try to start it for almost an hour before finally getting it started. Once started, you could hear it allover that end of the county. It sounded a lot like a real big John Deere “popping Johnny”. It didn’t take me long to figger out how to afford a submersible electric pump to put on that well. Kallison’s Farm Store was a wonderful place to get all things for the farm or ranch. Every morning at six AM Perry Kallison would be on the radio with his show. He would give all the farm news, livestock prices and most of all a classified list of things to buy, sell or trade. He would be real folksy in his presentation, “Well, friends and neighbors, old man Johnson in Bandera, has a quarter horse for sale or trade. This is a really fine quarter horse that will work your cattle for you. He will trade for what have you. Call him at 214J3 in Bandera, and he would love to visit with you whether you are going to buy his horse or not!” After 30 minutes he would always say,” It’s second cup of coffee time and let me tell you about the best bargain at the store.” I listened to Perry every morning and then we would always listen to Henry Howell with all the weather and farm and ranch news at noon each day on WOAI radio. Photo of Scenic Loop coutry found here. Photo of kangaroo cow found here. Photo of cows gone found here. Photo of one lunger pump found here. Photo of Kallison’s Farm and Ranch Store found here.